If you have been to Orlando before you may have seen the “upside down house”. It is quite the spectacle. Have you ever been inside? Wonder what it was? Wonder is exactly what it is, specifically “WonderWorks“. 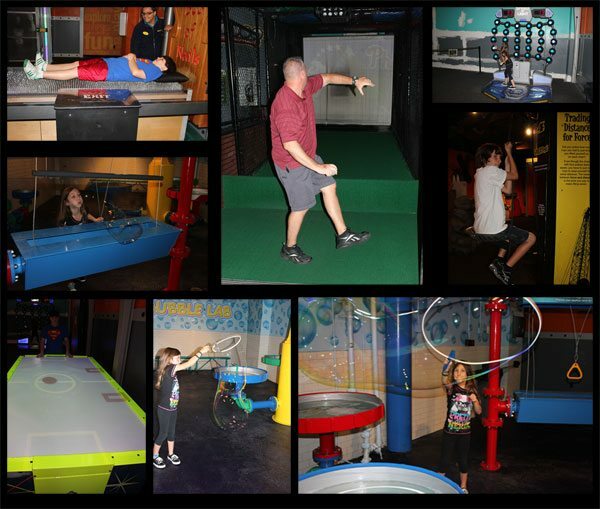 On our recent weekend trip to Orlando, thanks to the Hilton Garden Inn, we visited WonderWorks. The kids and I had previously been there a couple years ago, but the visit was rushed and missing my husband. Having spent the day at Sea World the day before we definitely wanted something inside and a little slower pace. WonderWorks ending up being the perfect fit. We got up early Sunday morning, had some breakfast at the Hilton Garden Inn and headed over to WonderWorks. 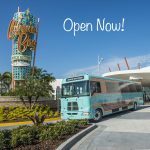 WonderWorks opens it doors at 9AM 365 days of the year. I think we arrived at 9:05. The visit this time was a word of difference compared to the last time. We didn’t have to wait to visit any exhibits. We had the entire house to ourselves. WonderWorks consist of several floors of over 100 exhibits. There were a few new exhibits that were not there over a year ago when we had visited last. 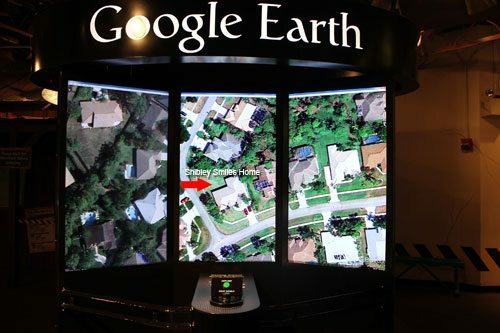 One of them was Google Earth. The kids had a blast starting with a map of the United States and zooming all the way down to our street. Living in Florida hurricanes are just something we deal with. Of course when they do hit we are in our homes surrounded by hurricane shutters. 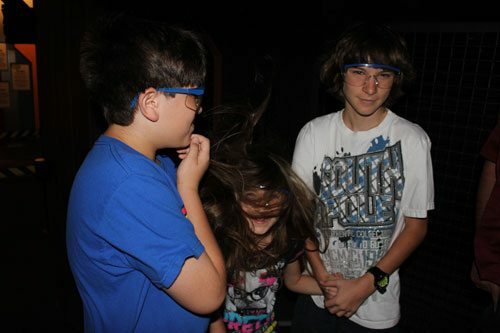 At WonderWorks you can experience the winds of a hurricane in a safe environment. I sent a postcard to myself that I should be receiving in 2013, that should be interesting if it makes it my way. 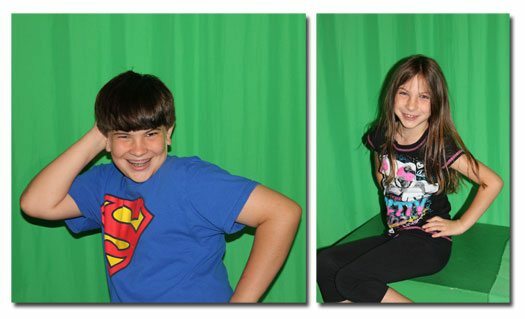 The kids posed in front of the “green screen” like they do in the movies. We moved up to the next level and found more fun and exciting exhibits. You could jump and see how high you could get, and view your self in silly fun house mirrors. Hubby and Nick both took a turn trying to strike out famous baseball players and seeing how fast they could pitch. Honey’s favorite was the bubble room where she could make bubbles three times as big as she. I played a game of mind ball (I think it was called) where you have to clear your mind and when you do you push the ball to your opponent. (I beat everyone) We played a game of shadow air hockey. Try switching from using your actual hand to using your shadow it is tough. I also played a game of catch the lights see how many lights you can push in a certain amount of time. This floor was pretty fun. Nick got to lay on a bed of nails, we got to ride a dirt bike (with a really uncomfortable seat), and you could sit in a share and pull on a rope lifting your own body weight into the air. Their were three of these chairs with each one containing different percentages of your body weight from 25% to 100%. We spent a lot of time on this level and being the only ones there it was pretty cool. We eventually moved on to the next level which consisted of another level of fun. One of the exhibits buddy wanted to revisit was the “Find the Bead” this is simply an exhibit of odds. A large tube with millions of orange and yellow beads, a few red and green ones through in the object is to find the purple one. 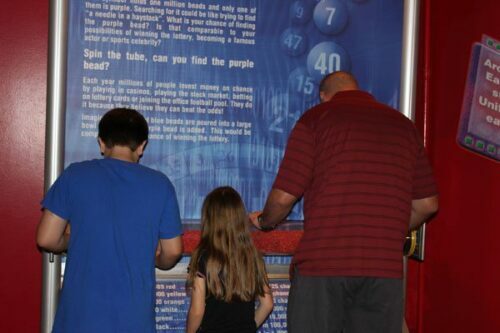 The exhibit explains the odds, but amazingly last year we actually FOUND the purple bead. One bead among millions. This year no such luck. 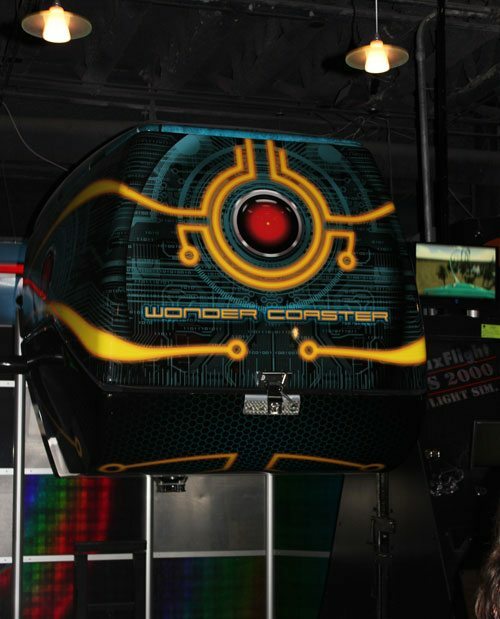 The biggest attraction on this third level which is geared towards playing the odds, space, and technology is the 360 virtual roller coaster. This is my husband’s kind of roller coaster one where you don’t actually go in the air but stay in a vehicle that just flips about 6 feet off the ground. Honey was a little scared but wanted to give it a try. She thought it was fun. I would have loved to have gotten a photo of her upside down with her hair hanging down. Our last stop was the level that contained the large attractions and the arcade. This is different a favorite level for the kids. They LOVE the arcade! 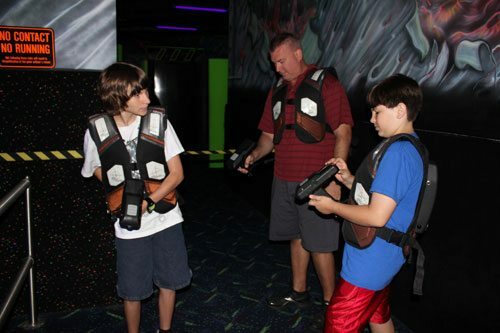 Before we let them loose the guys played a game of laser tag. Honey and I were aloud to go in and walk around and watch. I think of the three my husband had the most fun. I think because they were the only three in the game it was a little uneventful. I could definitely see where a room full of people would be a blast. We then went into the 4D theater to experience a wooden roller coaster on the loose. I love the virtual rides like this because Honey laughs so much it makes me smile. This again was my husband’s kind of roller coaster and I think his laugh was just as infectious. Before the kids (and adults) partook in the arcade the boys and I decided to do the rope climb. Now I’ve done the ziplining thing and loved it so I thought this would be no problem. BOY was I wrong! I was not happy at all to be walking around this course suspended in the air with only a rope tethered to me. Thankfully for me my youngest son after getting across one obstacle felt the same way. So being the caring mother I am I agreed to get off the course with him so he wouldn’t be the only one leaving. What mom’s will do for their kids 😉 Buddy had no problems navigating the course and made it through all the obstacles with ease. After our brave attempt at the rope course it was time to get our feet on the ground and enjoy a little gaming action. We purchased some tokens, split them up and proceeded to earn some tickets. Honey’s favorite arcade game is ski ball and she spent most of her time there. I have no idea what the boys played but they were constantly coming back for more tokens. After about 1/2 hour we traded in our tickets and the kids each got some candy and small plastic toys and we headed for the gift shop. Expect to be impressed at this interactive, entertaining and hilariously funny dinner show. Entertaining audiences for over fifteen years, Tony Brent combines a mixture of amazing magic, impersonations and high-energy improvisational comedy to thoroughly entertain audiences of all ages. Minds will be read, predictions will come true, and audience members’ personal items will vanish and re-appear. The Outta Control Dinner Show provides a one-of-a-kind entertainment experience for Orlando Florida attractions with non-stop audience participation. The crowds don’t just watch the show, they become part of it. Visitors to the show receive table side service with unlimited fresh hand-tossed cheese and pepperoni pizza, salad, popcorn and unlimited beer, wine, soda and dessert. The 90-minute experience will keep you on the edge of your seat and tickle your funny bone every 8 seconds. Disclaimer: I received two free tickets and discount tickets for the rest of my family. Opinions are my own and NOT influenced by monetary compensation. You may read more of my disclosure here. « Dad Can You Build Me a Clubhouse? I never heard of this place before! Definitely making a stop there next time I’m in Orlando. Hopefully in September. Looks like a great time for kids and Dad! I’ve never been. It looks like lots of fun! 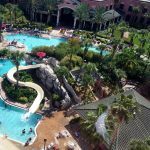 We have not been here yet, but it is on our list of placed to go when we make it down to Orlando again. I remember driving past it … Looks so much fun. I haven’t heard of this, but it looks and sounds like fun! I have never heard of this place either. It looks like a blast. My kids would really love it. We love Wonderworks, it is so much fun! We are going to Myrtle Beach in August and we plan on going to the WonderWorks there. I plan on Ziplining while I’m there. I can’t wait. Don’t know if I will do the rope climb or not. Oh wow! Looks so fun! What a great experience, looks like yall had so much fun. I’ve never been and always wondered about it. Thanks. I remembered going to this place when I was little, reading this article brought me back very good memories, Thank You! Great, nothing better then good memories from the past resurfacing. Sounds like a fun place! I’ve passed by there a bunch of times, but we’ve never been. I have stayed on Universal Drive before and have been by there many times and wondered what was inside, but have not gone in yet. It sounds like tons of fun! I know my guys would like it. We will have to try it out net time we are over in Orlando. I would love to take my grandaughter to WonderWorks. I have never been to Wonderworks, (I haven’t ever gone to Orlando.) However, these interactive events, even the dinner show, make me want to go there. 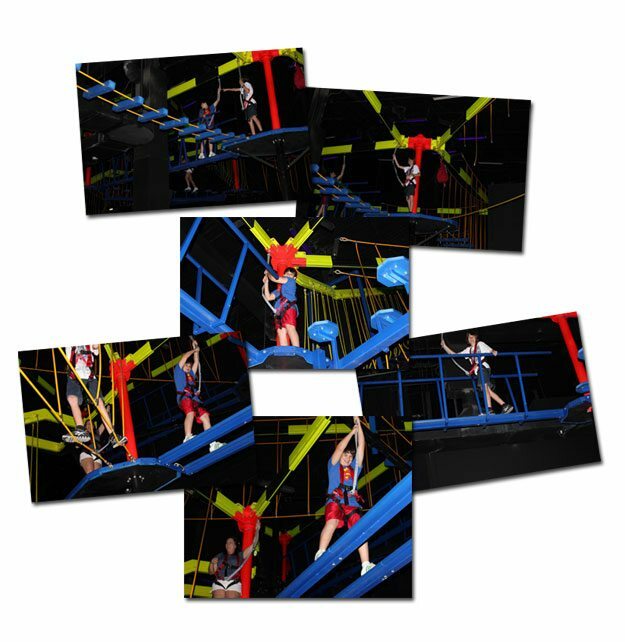 Just went to the one in Panama City… It’s as much fun for adults as for kids! Loved it! 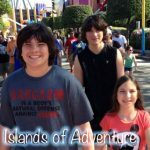 We went to WonderWorks in Myrtle Beach SC and my kids loved it. It was educational and since we homeschool I loved the experience.